On what was the best weekend of year so far, weather-wise, cycling events were plentiful. 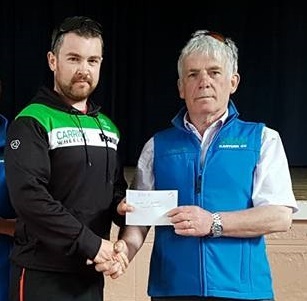 The three events, the Victus Tour of Ulster, the O’Leary Stone Kanturk 3 Day and the Frank O’Rourke Memorial in Wexford, had our riders shared out amongst three corners of the country. However, the big results came from Kanturk. On Saturday afternoon, Tom O’Connell stormed to victory in Stage 1 of the 4 stage A4 event. The stage, which started and finished in Kanturk town, covered a distance of 66km. A couple of attacks came early but nothing of any great importance. O’Connell, taking advantage of a stall in the bunch about 3km from the line, gave one more kick and managed to get away. The line came just quick enough before the group caught him and he came away with his first win for Panduit Carrick Wheelers. Stage 2 on Sunday morning was an 8km Time Trial and while not being O’Connell’s favourite discipline, he came away with 11th place, 24 seconds behind the stage winner. This was followed in the afternoon by another road race, 4 laps of a 14km circuit. There was a lot of jumping by various riders trying to close down the gaps in GC. “I sat in for most of it, held good position for the last 1km and opened up the gallop 300m from the line” said O’Connell but unfortunately it was not to be, as he had to settle for 3rd place. The 4th and final stage, a 72km hilly circuit with an uphill finish closed out a great weekend of racing. Coming away with 11th place in this stage, O’Connell finished in 8th place overall. So a 1st and 3rd places in the stages culminating in 8th place in GC, sees him upgraded to A3 now, just in time for the next big race of the season, the Shay Elliott Memorial in Wicklow next weekend. Our Youth riders were also in action in Kanturk as their 3 Stage event coincided with the Senior racing. Patrick O’Loughlin, Under 14, came away with 6th place in the Stage 1 but it was Tom Kinsella in the Under 12s category, who is in flying form this year, who came out on top, taking 2nd place in Stage 1, 3rd place in Stage 2, 2nd place in Stage 3 and 3rd place Overall. These two lads are featuring in results week in week out and with the Panduit Carrick Wheelers – O’Ceallachain’s Youth League starting next week it will be interesting to watch them in action close to home. Some of our A1/A2 riders had their final tune-up ahead of the Rás this weekend, in the Victus Tour of Ulster. The Rás Tailteann, which will begin in Drogheda on Sunday week next, 20th May, is the biggest race on the Irish cycling calendar. Keep an eye on our Facebook page for the team announcement in the coming days.